The FTSE 100 index closed down 53 points on Tuesday, and although stocks are seen opening slightly higher this morning, signs of a sustained rebound look scarce because of all the uncertainty surrounding Brexit. The draft Brexit withdrawal deal sees the UK leaving the EU on March 29, 2019 but a transition period will begin from that day to last until December 31, 2020. Focus today lies on Brussels, as UK Prime Minister Theresa May travels to meet European Commission President Jean-Claude Juncker. The economic calendar today has UK public sector net borrowing at 0930 GMT and US durable goods orders at 1330 GMT followed by existing home sales at 1500 GMT. 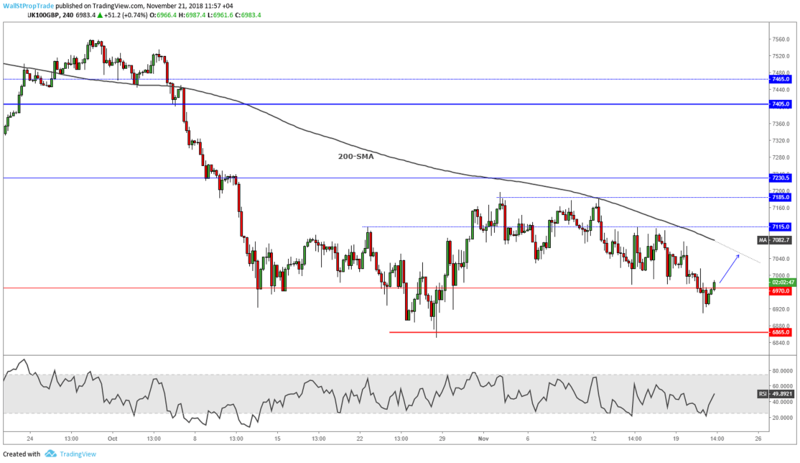 The FTSE 100 ended Tuesday's session below 7000 at 6947 breaking through the key technical support level at 6970. The index is seen rebounding slightly this morning and buyers try pushing back to the 200-period moving average now acting as resistance. With prices trading close to this year's low at 6855, downside momentum could accelerate should the market break out to new lows for the year.